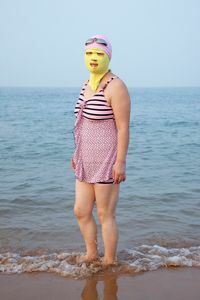 Posing proudly in the early morning light, the swimmers protect themselves with bright hoods that cover their entire faces like balaclavas. 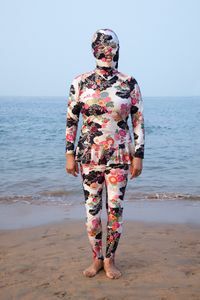 The rest of their bodies are also clad in colorful swim gear, from a full bodysuit of scarlet polka dots, à la Yayoi Kusama, to smart swim-dresses that wouldn't look out of place at a dinner party. 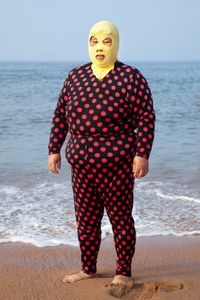 The quirky swimwear protects from the sun's harmful rays as well as the area's giant stinging jellyfish.